Many exciting announcements for the Disney Parks during D23, including Star Wars: Galaxy’s Edge, with most set to be completed by 2021. This year’s Walt Disney Parks & Resorts Panel at D23 Expo 2017 was packed full of exciting announcements and upcoming additions to the Disney Parks over the next five years. 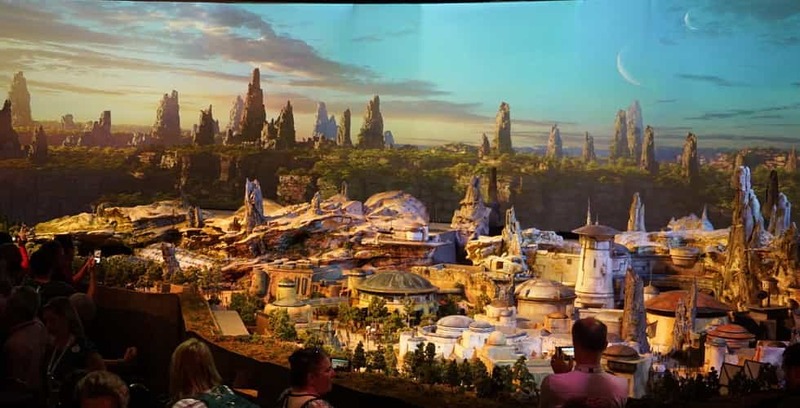 Star Wars Land’s official title is “Star Wars: Galaxy’s Edge.” The name applies to both lands in Walt Disney World and Disneyland, both set to open in 2019. A detailed model for the land was also revealed. A ‘Guardians of the Galaxy’ attraction will replace Ellen’s Universe of Energy in Epcot. The ‘Ratatouille’ ride from Disneyland Paris will make its way to the France Pavilion in Epcot. Shanghai Disneyland’s most popular ride, Tron Lightcycle Power Run, is coming to Tomorrowland in the Magic Kingdom at Walt Disney World. The Skyliner gondola transportation system is coming to Walt Disney World, along with a brand-new Disney Vacation Club resort, Disney Riviera Resort, to serve as the gondola hub. Disneyland Resort’s Paradise Pier is set to become Pixar Pier during the park’s Pixar Fest in 2018. The Hotel New York in Disneyland Paris will be rethemed into a Marvel Hotel, and an immersive, luxury Star Wars hotel is coming to Walt Disney World. A new, live entertainment venue inspired by the Willis Wood Theater is coming to Main Street USA in the Magic Kingdom at Walt Disney World. Disney reveals a ‘blue sky’ concept for the future of Epcot’s Future World, including more trees, the removal of Innoventions, and more. Toy Story Land gets an official opening window of Summer 2018. Most of these updates will be completed by the 50th anniversary of Walt Disney World in 2021, though some of the upcoming additions will be complete by 2019. Some, however, like Mickey and Minnie’s Runaway Railway, have not yet received a completion date or year. Check out videos of the musical performances during the panel, and more our coverage from D23 Expo 2017 below. Stay tuned to our Twitter, Snapchat @attractionsmag, and our website for all the latest in Disney news.